This is me (and my badly in need of a fresh pedicure feet) out on the Hudson River, facing New Jersey. To my left was a Coast Guard guy, watching me with binoculars. I was taking pictures while probably drifting in a little too closely to the wind tunnel for the Holland Tunnel. (Such is life in post 9/11 New York City.) Not on purpose or to taunt the guy, more a matter of I don’t really have a lot of control, this being only my second time out. Kayaking is an incredibly invigorating thing to do, I love it. A volunteer organization called The Downtown Boathouse gives free lessons and provide kayaks, for FREE, so you can kayak on the Hudson River. I’m going to try to practice so I can go on a trip to Governor’s Island in a couple of weeks. There’s a race next week between 56th and 72nd Streets. The guys who showed me how to kayak suggested entering the race, just to see if I can finish it, not win. If I can finish it, I can probably deal with the trip to Governor’s Island. But it feels great. It just feels great. It’s energizing, even when you’re just floating. 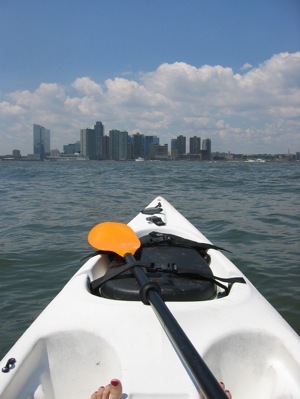 I researched kayaking trips on the east coast. Most emphasize white water, which I’m sure is fun, and I want to try it, but what I really want is a nice weekend trip, more of a leisurely kayaking, enjoying the scenery and being out on the water thing. Maybe something with white water and stretches of calm. The Delaware River looks like it fits the bill perfectly. It looks like it offers exactly that. And there’s a few places in West Virginia. That sounds like heaven. I didn’t think of that, a nice leisurely float on a lake with my morning coffee. Jesus, that is a wonderful image. Ha! Thank you for the tips, Larry!